The core of the Hindu thought forms the basic concepts of matter, soul and God and the nature and relationship between each of them. Each soul’s destiny is determined by the universal law of Karma (action and reaction). By performing pious activities, good karma is accrued which leads to attaining of a higher birth. God is described as Sat-Chit-Ananda (Truth –Knowledge-Bliss) and is referred to as All knowing, Indweller and Supreme. In order to facilitate worship and devotion, the human mind needs to focus on an object of worship. Hence there are various deities and the temple is the sacred place where they are worshipped. Temples provide opportunity to reflect peacefully and its spiritual atmosphere helps the pilgrims to meditate on the Divine Supreme Being. Temples reflect the symbols of Hinduism and these have deep inner spiritual significance. The art and architecture of the temples reflect the culture and tradition of various dynasties which have contributed to the rich legacy and glory of India. One of the most famous temples in the Indian state of Jharkhand is the Baidyanath temple or Baidyanath Dham or Baba Dham as it is referred to in the town of Deoghar. The Shiva Purana mentions the Jyotirlingas and their locations. The archives of the Maharaja of Gidhaur who were patrons of the temple provide information about the temple and its surrounding areas. It is said that the East India Company took interest in the administration of the temple after the Battle of Plassey and later handed over control to the Pandas or high priests. The place has also been mentioned in the Matsya Puran as holy and sacred ‘Arogya Baidyanathitee’ as Shiva and Shakti are said to reside here and free people from incurable ailments. The pilgrimage is said to have been recognised even in the Muslim period as mentioned in the Kulasatu-i-twarikh written between 1695 AD and 1699 AD and referred to by Dr Sarkar on his work on Aurangzeb. Lord Ram, Sita and Lakshmana are also said to have visited this sacred temple. It is said that once Ravana the King of Lanka propitiated Lord Shiva and requested him to come to Lanka. Shiva instead gave him one of his Jyotirlingas and cautioned him not to break his journey and deposit the Linga anywhere on the earth as then it would get fixed there. Ravana agreed and taking the Linga started his journey back to Lanka. The Gods were apprehensive of the powerful Linga being set up at the seat of the demon King. The God of the oceans, Varuna then entered the body of Ravana which forced him to descend on earth to relieve himself. Lord Vishnu then met him there in the form of a Brahmin and Ravana requested him to hold the Linga for a few minutes to help him. Vishnu agreed but as soon as Ravana turned his back, Vishnu placed the Linga on the ground and vanished. On returning, Ravana realised the trick as it was stuck to the ground. It is said that in anger he tried to lift it but in vain. In the process he broke a piece of the top of the lingam. Finally acceding defeat he then bowed to the Linga and began to come everyday from Lanka to worship it. This place came to be known as Deoghar (House of God) and the spot where Ravana descended on earth is Harilajori, four miles north of Baidyanath Dham. Another time Ravana began severe penances to obtain boons from Lord Shiva and began cutting off each of his ten heads to offer to the Lord as sacrifice. Shiva pleased with his devotion then descended and cured Ravana and restored his ten heads. Hence Shiva is referred to as Vaidhya or doctor and the temple derived its name. According to another legend in the Padma Puran, after Vishnu in the garb of a Brahmin took the linga from Ravana, he consecrated it with water from a nearby tank. After Vishnu disappeared, a Bhil watching informed Ravana on his return about the happenings. With his arrow Ravana then brought all the sacred waters from earth to form a pool. 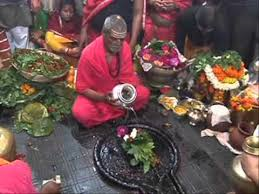 After Ravana’s death the Linga lay neglected and was found by a hunter named Baiju who worshipped it daily and the place came to be known as Baidyanath Dham. According to another legend, after the death of Sati the consort of Shiva in self immolation, Shiva became furious and fearing that he would destroy the world, Vishnu cut the body into 52 parts which fell on different parts of the earth as Shakti Pithas. The heart of Sati is said to have fallen at Deoghar. The Shiv Mahapuran mentions another legend in which Brahma and Vishnu had an argument on the supremacy of creation. Shiva then wished to test them and he manifested himself as a huge, endless column of light. Moving in either direction, Vishnu conceded that he could not locate the end but Brahma uttered an untruth that he had found it. Shiva cursed Brahma saying that he would never be worshipped in ceremonies while Vishnu would be worshipped till the end of eternity. Shiva manifested as 64 lingams in the column of light, of which 12 are said to be most auspicious Jyotirlingams. Each of the sites takes the name of the presiding deity and all the 12 deities are considered different manifestations of Lord Shiva. One of them is the Baidhyanath Jyotirlinga at Deoghar. The temple is 72 feet tall, lotus shaped and faces the East. Legends state that the temple was built by the architect of the Gods Vishwakarma. The temple has three parts, the main temple, the middle part and the entrance. Three ascending shaped gold vessels are compactly set on top which was said to be donated by Raja Puran Singh of Gidhaur. There are five knives in trident shape (Panchsula) besides these vessels and a eight petalled lotus jewel (Chandrakanta Mani). There are different porches in the temple, one which leads to a row of pillars spanned by basalt blocks with a sandstone image of a bull on the right side. Another porch leads to the portion where the Linga is fixed. There are bells fixed in the ceiling with ropes which are rung by the pilgrims to announce their entry into the temple. There is a large vat to collect the milk and water offered as ablutions to the Linga. From the centre of a large basalt slab, the cylindrical form of the Linga is about 5 inches in diameter projecting to about 4 inches. The top of the Linga has an uneven surface and is broken with a portion of the Linga being buried, though it is not possible to ascertain the exact quantity. There are eleven other temples in the courtyard namely Kali, Kal Bhairav, Jagat Janani, Lakshminarayan and others with the Parvathi temple connected to the main temple with huge red sacred threads emphasising the union of Shiva and Shakti. There is a well in front of the main entrance of the courtyard called Chandra Krupa, the waters of which was said to have been brought together by Ravana. Unlike other Jyotirlinga temples, the devotees in this temple are allowed to offer Abhishekha to the Linga directly which gives them a feeling of immense satisfaction and bliss. A number of festivals are celebrated at the temple which is managed by the Baba Baidyanath temple Management Board. They are responsible for the day to day running and other activities of the temple. The most important fairs or Melas are Shri Panchami Mela held in January, Shivaratri Mela held in March and the Shravan Mela held in September. Millions of pilgrims collect water from the Ganges at a distance of 108 km from Sultanganj and offer it to the holy deity. Some of them walk barefoot all the distance carrying the holy water, singing and chanting the name of Lord Shiva. Air – The nearest airport is Patna which is at a distance of 229 km from Deoghar. Rail – The nearest railway station is Jasidh, a town in Deoghar which is at a distance of 10 km on the Howrah Patna Delhi line. Road – Passenger buses run regularly from all major towns and cities to Deoghar. Taxis and rickshaws are available to facilitate easy movement. There is accommodation within the temple complex ‘Uma Bhawan’ which has rooms and dormitories with all facilities. There are also dharamshalas and hotels at Jasidh and Deoghar to suit all budgets. Every temple is India is rich in art and architecture and worship in these temples is more meaningful if the pilgrims reflect on the significance, mythology and legends behind it. This strengthens devotion and encourages the seeker to attain higher goals. The spiritually surcharged environment of the great temples which have stood the testimony of time for thousands of centuries creates a current which helps all those who enter the temple. The beautiful temples with excellent architecture constructed by the various dynasties reflect the glory and rich cultural heritage of Ancient India.